For pasta-lovers, classic Alfredo is more than just tradition…it’s pasta perfection! Let’s start with this classic sauce and bring in the delightful taste of seafood, finished by the succulent background flavors of roasted garlic, mushrooms, and basil. You’ll be sure to please even the most selective pasta enthusiasts! Recommendation: Serve with fresh, warm bread. For wine, pair it with a full-bodied white, such as a rich, buttery Chardonnay or Viognier. The intense, roasted garlic undertones in the sauce will meld wonderfully with a full-bodied white. First, roasting garlic requires a bit of advanced preparation. Leave the heads of garlic whole. Slice off the very top of the head, trying to expose the tip of each of the individual cloves. Drizzle a small amount of olive oil over the top. Use a garlic roaster if you have one. Otherwise, wrap the heads inside of tin foil. Bake at 400 degrees for about 45 minutes. Remove the garlic from the roster immediately and set aside to cool. When cooled enough to handle, squeeze the cloves out one-by-one. The cloves should be very tender, but remain whole. Cut larger cloves in half. *** Tip: When roasting garlic, roast several heads at a time. Squeeze out any extra cloves, zip-lock, and keep in the refrigerator for use over the next week. These are great to have on-hand for use in quick meals. *** Tip: Using frozen shrimp in this dish is a choice, and you may certainly start with fresh! However, don’t be scared of heating up pre-cooked shrimp. As long as you don’t overcook, they are fantastic in your favorite dishes. In this case, we are adding the cold shrimp to the finished sauce and simmering on low heat. As we are adding them at the end for only a short time, this will heat the shrimp and bring out the wonderful seafood flavors into the sauce, but not overcook and dry out the shrimp. Thaw the shrimp under cold water, grate the parmesan, halve the mushrooms, and cut basil into long, thin strips. Reserve several large basil leaves for garnish. Also, reserve about ten percent of the parmesan. Begin heating up water with a touch of olive oil in a large pasta pan. Slide your best pasta dishes into a warm oven. If you baked fresh bread, the oven will still be warm. If the oven is not already heated, bring up the temperature to about 200 degrees. Use oversized dishes if possible for the best possible presentation! Add your pasta to the now-boiling pan of water. Cook until “Al Dente” (about 7 minutes). 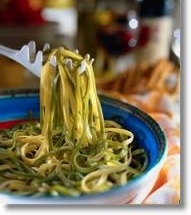 Remember, pasta continues to cook and soften after removed from the water, so strain when it is slightly firm. When serving, if pasta ever becomes dry and sticky, run under hot water from the faucet for a few seconds. Bring a large pan up to high heat with a splash of olive oil. Add the mushrooms and sauté for about 3 minutes until the moisture begins to come out. Remove the mushrooms (they mushrooms should be firm at this point). Deglaze the pan with a bit of white wine. The wine will cook off very quickly. When it is reduced by half, add the heavy cream, a small handful of dry Italian seasonings, and a generous amount of fresh ground pepper. When the cream begins to bubble, slowly start sprinkling in the cheese, stirring constantly. The sauce will begin to thicken. Be very careful not to burn the cream! When the last of the cheese has been incorporated, add the garlic, basil, shrimp, and the mushrooms. Reduce the heat and simmer on low for about three minutes until the shrimp are hot. Time to serve! Toss a handful of pasta on each plate. Add a scoop of shrimp and mushrooms into the very center of the plate. Add a second scoop of just sauce around the edge to coat the pasta. Sprinkling parmesan cheese over the top and around the rim of the pasta dishes for presentation. Add a basil leaf or two. Serve immediately, and be sure to warn your guests that the plates are hot!